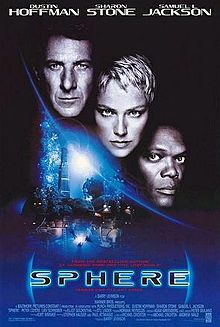 Today, I’m going to cover the 1998 Michael Crichton adaptation, Sphere. The director for Sphere was Barry Levinson, who is known for movies like Wag the Dog, Sleepers, Toys, Rain Man, The Natural, Good Morning, Vietnam, and Bugsy. Sphere is based on a novel of the same name by Michael Crichton, who was a well-known producer and director on top of being a best-selling author. Westworld, Jurassic Park, E.R., Congo, Twister, The 13th Warrior, Timeline, The Andromeda Strain, and many other prominent television shows and movies were either adaptations of his works, or were directly created for the screen by him. While Crichton did occasionally provide screen treatments for his own novels, in the case of Sphere the adaptation work was done by Kurt Wimmer, who is best known for writing and directing the movies Equilibrium and Ultraviolet. Additional screenplay credits were also given to Paul Attanasio, who has also written for films like The Good German, Donnie Brasco, Disclosure, Quiz Show, and The Sum of All Fears, and Barry Levinson’s former assistant, Stephen Hauser. 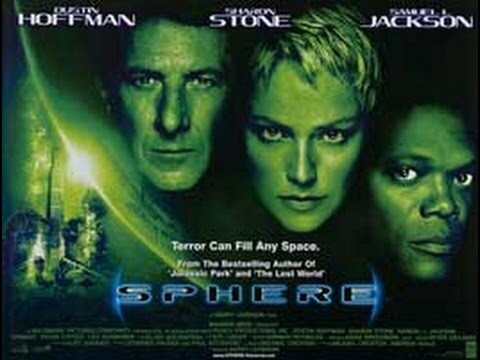 The cast for Sphere includes Dustin Hoffman (The Graduate, Rain Man, Marathon Man, Straw Dogs), Sharon Stone (Casino, The Quick and The Dead, Total Recall, Basic Instinct), Samuel L. Jackson (The Hateful Eight, Pulp Fiction, Jackie Brown, Django Unchained), Liev Schreiber (Spotlight, X-Men Origins: Wolverine, Goon), and Queen Latifah (Taxi, Chicago, Bringing Down The House, Stranger Than Fiction). 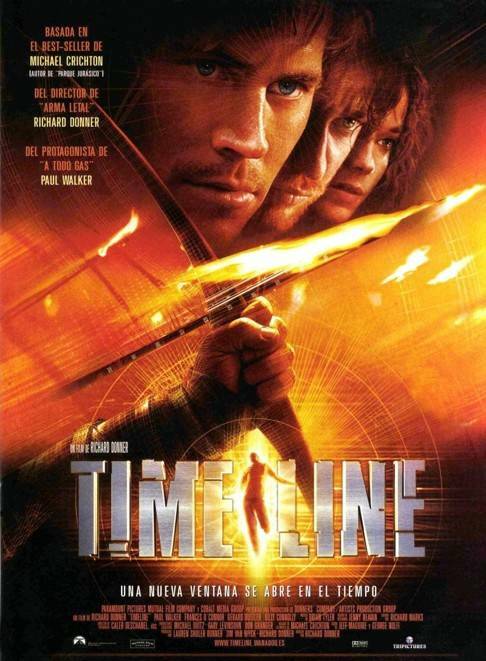 The cinematographer for the film was Adam Greenberg, who also shot movies like Rush Hour, North, Eraser, Ghost, Three Men And A Baby, Terminator 2: Judgment Day, Iron Eagle, and Near Dark. The editor for Sphere was Stu Linder, whose other credits include cutting Quiz Show, Rain Man, Sleepers, Wag The Dog, and Toys, among others. 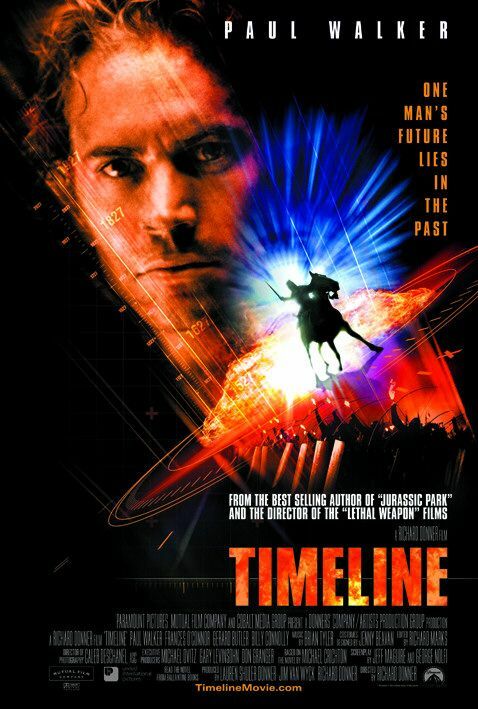 The musical score for the movie was composed by Elliot Goldenthal, who also provided music for the films Heat, Frida, Batman & Robin, Demolition Man, Alien 3, Pet Sematary, Batman Forever, Titus, Public Enemies, and Across the Universe, among others. 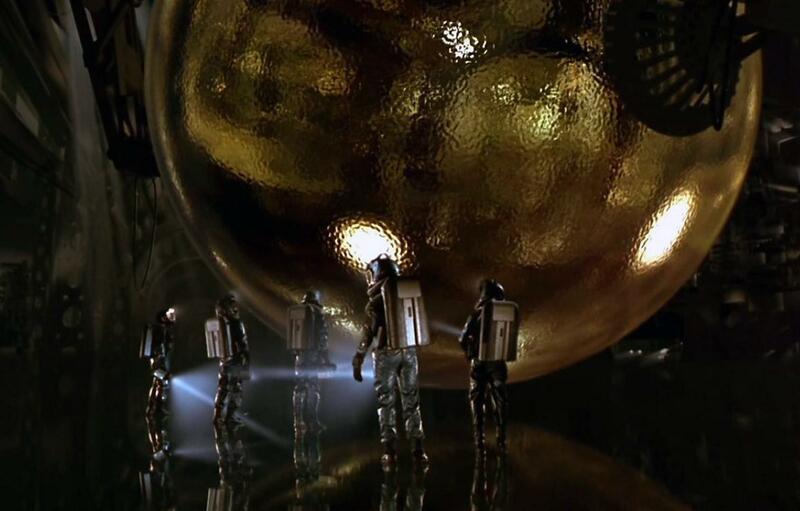 Sphere‘s production designer was Norman Reynolds, who also designed movies like Raiders of the Lost Ark, Return of the Jedi, The Empire Strikes Back, Alien 3, Mission: Impossible, and Return to Oz, and additionally served as art director for Star Wars – A New Hope, Superman, and Superman II. 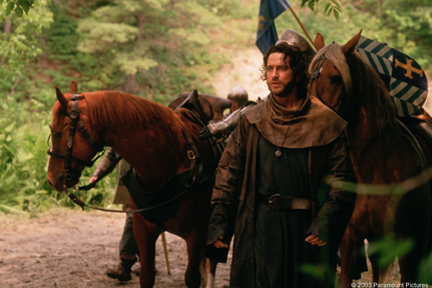 As with any adaptation, there are a number of details from the Sphere book that were changed for the film. Aside from the elimination of a few characters, the most interesting of these changes is actually the eponymous sphere’s coloration. In the book, it is silvery and chrome-like in appearance. Apparently, this was initially supposed to be the case on screen as well, but the decision was made for the sphere to be gold in the middle of the production, apparently for aesthetic reasons. Interestingly, the ending of the movie was re-shot due to complaints from test audiences. While these sorts of changes are typically in response to petty complaints from fickle or shallow audience members, in this case, the change made the move more sensible. 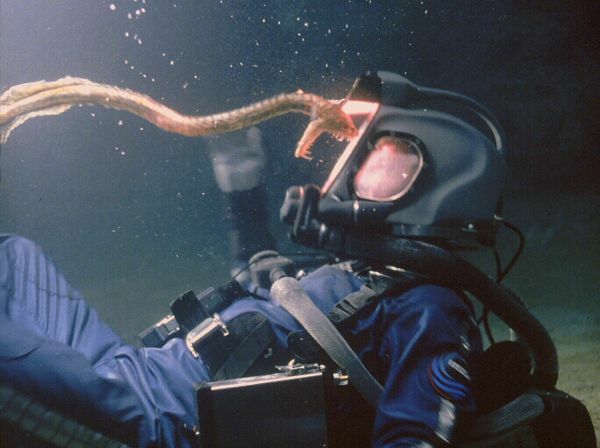 The initial cut failed to account for the decompression needed for the characters to acclimate from being in the far depths of the ocean, and test audiences didn’t buy it when the survivors made it to the surface. Sphere grossed just over $50 million in its worldwide theatrical release. However, the production budget alone has been recorded as anywhere from $73 million to $80 million, making it a significant financial failure. Unfortunately, the critical reception to the movie wasn’t any better: it currently holds Rotten Tomatoes scores of 12% from critics and 38% from audiences, along with an IMDb user rating of 6.0/10. Personally, I think there are definitely some things to like about Sphere. For instance, Samuel L. Jackson is pretty damn good here, and is about as restrained, menacing, and cerebral as you’ll see him in anything. In general, the small cast puts out some solid performances. Aside from Jackson, Liev Schreiber is always a great supporter, and Stone does a serviceable job with her role. However, I think Hoffman doesn’t quite fit with the rest of the cast, and wasn’t the best choice to lead the film. I suspect that Levinson just likes working with him, and he was the most bankable name that was available to the production. The biggest positive for the movie, however, it its design. The underwater facility just looks cool, and does a lot for the atmosphere of the film. Everything has a compelling science-fiction appearance, and it gets across the concept of the deep sea as a foreign world. Likewise, I really like the concept for the story. I remember reading the book many years ago, and liking it quite a bit. The story is a bit surreal and highly psychological, which could have made for something compelling on screen. The book uses the high tension, claustrophobic setting to great effect, so there was certainly something for the film to work with. In the right hands, Sphere could be an effective science-fiction whodunnit, not unlike The Thing. At least, the blueprint was certainly there. Unfortunately, in spite of the performances, the design, and a decent source, this movie is incredibly boring and forgettable. Honestly, it is a bit difficult to nail down exactly why. The whole movie feels a bit rushed, which makes it particularly difficult to get invested in the characters. At the same time, it is far from action-packed, so it is hard to say where all of the time goes. The movie certainly could have benefited from some character building sequences, as well as some better moments of sustained tension. I think the biggest issue with the movie is that it was just put in the wrong hands. There’s nothing about Barry Levinson’s works that would indicate that he’d be a good fit for a psychological science fiction thriller. On top of that, the screenplay sounds like it was bounced around quite a bit, and probably suffered from that. 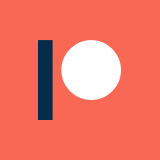 Overall, as I stated previously, Sphere is pretty forgettable. I do think that the source could make for a good sci-fi thriller someday, but this certainly isn’t it. With the recent television success of Westworld, I’m hopeful that people will start digging back through Crichton’s works, and will see the potential that was squandered with this iteration of Sphere.